As a part of our continuing efforts to give consumers with accurate information regarding online writing services, we are providing the following review and assessment of the company, MasterPapers.com, a writing service that has been in business since 2004. We are basing our review on several criteria, to include a thorough investigation of the site itself, the Master Paper testimonials that appear on that site, customer comments and feedback we have found elsewhere on the web, samples of writing that are provided for review, and our own experience in ordering an undergraduate research paper from Master Papers. The site advertises that it produces all types of academic writing and other coursework assignments for students at all academic levels. In addition, it offers admissions essays at both the college and graduate program levels, resumes, web content writing, and a variety of business writing needs. As well, there are editing and proofreading services available. Types of academic writing are listed by links at the top of the home page. Other available services are found by navigating through the rest of the site. Our MasterPapers review found all of the additional services listed in drop down menus on the order form. While on-site testimonials were quite positive, customer reviews elsewhere listed issues with writing quality. We reviewed a sample term paper on human resources management. The work had many grammatical and structural errors and the content was obviously from the 1990’s as it spoke to corporations that are no longer in existence. The research paper we received was well-organized but contained many grammatical errors and we were unable to locate one of the resources that the writer claimed to have used. Relative to writers, the site states that all of its writers have Master’s or Ph.D. degrees and that they are carefully screened prior to employment. We wonder if some of them may be non-native English speaking, given the amount of grammatical issues in the produced writing. We also noted that completed products are not automatically reviewed for quality by anyone prior to delivery to a customer. Most other services provide this, but this company charges extra for that service. Despite quality issues, we can definitely state that MasterPapers is not a scam. There is no pricing chart; however, customers can get a rough pricing quote by entering information into a quote form. MasterPapers.com prices begin at $11.30 for a high school essay and increase based upon academic level, type of product, and deadline requirement. The company accepts all major credit cards and PayPal and does have a secure SSL certified third party payment processor. MasterPapers discounts appear to be available only to new customers and those are set at 15%. 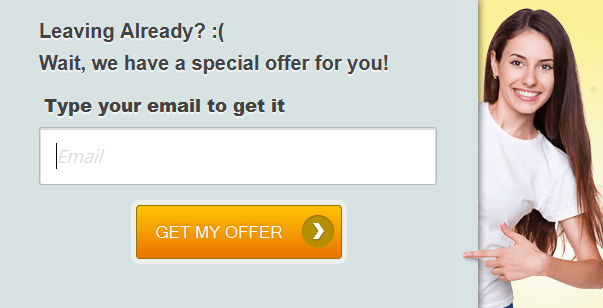 According to the site, if one submits an email and registers for the newsletter, they will receive notification of special offers which they can retrieve by a MasterPapers.com coupon codes within those emails. When we placed our order, there was a place to insert a Master Papers promo code, so we are assuming that these are provided in those emails. There is a bonus plan for all customers. 5% of an order price will be placed on reserve in each customer’s personal account which can be used toward future orders. This is a permanent feature. Master Papers maintains a customer support department that is open 24 hours a day, and there is a phone number and email address for contact. There is also a live chat feature for questions. There are free pages offered as well – title and bibliography. Customers can select “top-quality” writers for an additional fee, as well as editing of a finished product. MasterPapers BBB membership is a positive sign, and there have been no major complaints lodged against the company. 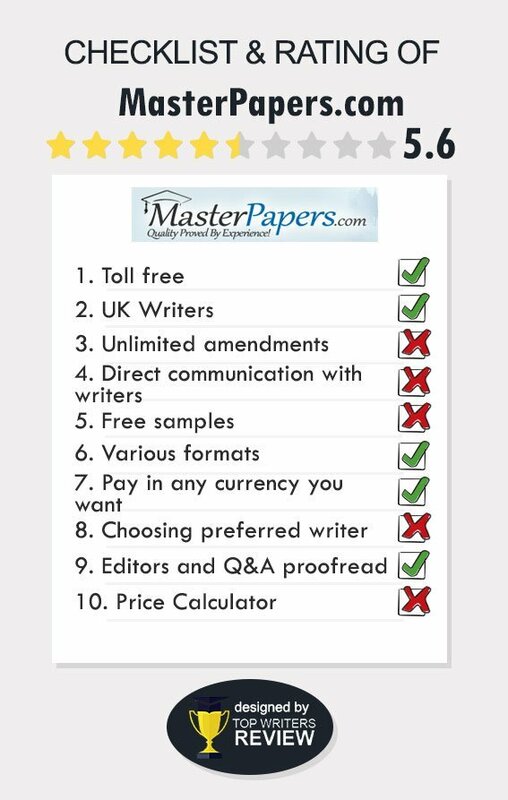 In terms of MasterPapers.com pros & cons, we would state the following: While the company is obviously legitimate and does provide writing services as promised, we do have concerns about the quality of writing that it produces and the fact that its sample writings appear to have been written before the company began its operations. They could be a nice writing service if not for too much red tape. A customer can do literally nothing! There is no opportunity to choose a writer, to learn about their expertise or anything at all, communication with your writer isn't allowed. You basically buy a cat in the sack! I spent half the semester in sick and, having come to my first programming class, received a problem to solve, first thing. I realized I didn't have the clue to it in the material I had for self-preparation but the instructor didn't want to listen. So I had to seek help somewhere else and this is how I got here. Thanks, Master Papers for your detailed solutions and insightful comments. I hoped to get at least some help with my term paper. Instead, I received a parody on a paper for a sophomore level. I couldn`t stand it and placed my issue on their web page. But they didn`t think it was important and gave me no feedback at all. Don`t like them. I used this service several times and each time I got a paper in a different quality. A couple of times the text was hardly readable so they had to rewrite it. Then once I had no time and quickly edited the paper on my own. Thankfully, the instructor for that subject wasn't too attentive. The positive side - they are quite cheap. So, it's up to you to decide.